A version of this article was first published in the Seattle Times, August 23, 2017. When people contact us about remodeling a bathroom in their Seattle home, one of their first questions is often about price. How much will it cost to turn my dated, worn-out space into a sparkling bathroom that looks great and suits my needs? The total bathroom remodel cost is based on many variables, and most remodeling companies need to gather quite a bit of information about the scope of your project to give you an accurate estimate. However, the price tag can be higher than many people expect for such a small room and much more than the "fantasy" prices shown on reality TV shows on HGTV. That said, the amount you spend is within your control. Here are a few tips for minimizing your costs without cutting corners. If your goal is to save money, it seems counter-intuitive to hire a pro right at the start of your project. However, with a professional designer on your team, you will start your project with a solid plan and a realistic budget, potentially avoiding expensive mistakes during the construction phase. A professional designer will also help you get a handle on the numerous design decisions that pop up during the course of a project. Hiring a contractor to start work without a fully thought-out plan is a recipe for disaster. While certain major bathroom renovations include the relocation of a toilet or tub, you'll save money by leaving them where they are. If you're remodeling a standard 5' x 7' Seattle bathroom, you probably don't have much of a choice anyway: the basic layout you have is likely the only one that will work in your space. Even if you don't move fixtures, you will have plenty of opportunity to choose new ones and make other updates to make your bathroom just right for you. 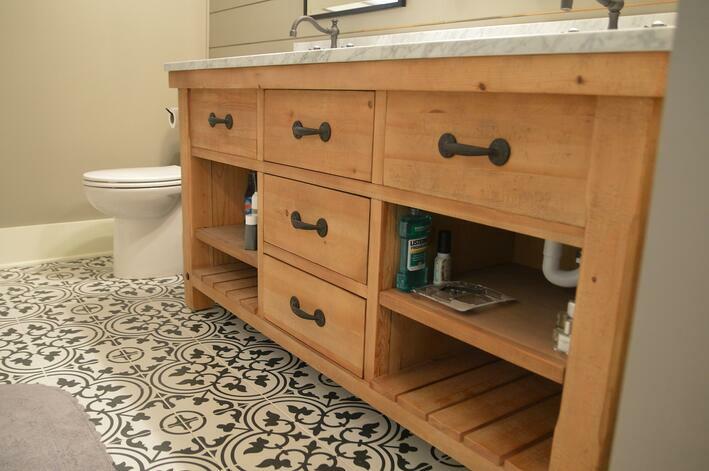 There is no doubt that tile is durable, easy to clean, and has endless design possibilities. That's why it is such a popular choice for bathroom remodels. But if you want to keep the cost of your remodel down, choose your tile wisely. Designer or artisan tile can add a one-of-a-kind look to your bathroom, but an interior designer can recommend lower-priced tile options, creative patterns, and interesting grout colors that will produce just as much pop for a lower price. Also consider reducing the square footage of your tile installation. There's no reason the tile in your shower surround needs to reach all the way up to the ceiling. And for walls away from the shower or tub, consider other materials. For instance, painted wood bead board can really warm up your space while still looking sharp. If you're trying to save money on your bathroom remodel, it's tempting to choose a smaller vanity or skimp on shelving. Please don't. Bathrooms need to be functional spaces, and ample storage for all your stuff is a must. We've all seen bathrooms where every square inch of counter space is covered in cosmetics, hair products, and other stuff. To save money on cabinetry, consider lower-cost open shelving options. Bathroom plumbing fixtures vary widely in price and quality. As a rule of thumb, always choose the highest quality fixtures your budget allows. They don't have to be fancy, but you do want them to last, especially if they are installed behind your walls, like your bath mixing valve. Why do bathroom light fixtures tend to be an afterthought? With little effort, you can find fixtures that will make a statement for under $200. For general lighting, well-placed LED can lights can really brighten up your bathroom. Unlike kitchen sinks that really take a beating, bathroom sinks see relatively light duty. Skip the name brands and search online for a basic ceramic under-mount model. Nobody will know the difference, and you can put the savings into more decorative elements. If you recently completed a bathroom remodel, we'd love to hear how you saved money. As always, CRD's in-house team of designers is happy to help answer your questions about choosing materials and smart bathroom design. Feel free to get in touch. I also encourage you to check out our bathroom pricing guide, which provides price ranges for bathrooms remodeling projects of various levels of finish.